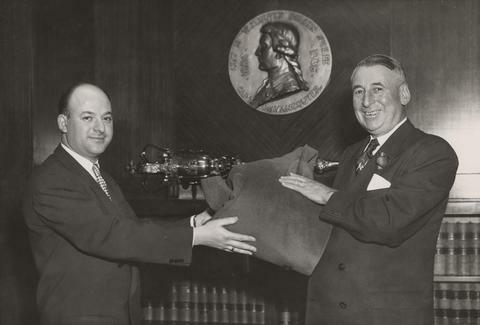 Photograph depicts two men, possibly Almann and Huml, holding a piece of fabric. Behind them hangs a large coin, which reads "City of Vancouver Golden Jubilee 1886-1936 Cape Vancouver" as well as a mace. Written on the verso: "[Almann], [Huml]. Feb 27 1952."